This ONLY works with your help; PLEASE send us any info on rides, events, and bike nights!! If we made a mistake or dates/times/locations are incorrect – please let us know – KalamazooBiker@gmail.com or leave a comment – Thanks! Info: Leather, used parts, helmets, gloves, etc. Great if you want to try on sizes. Not sure if they’ll have green beer. Info: Leather, used parts, helmets, gloves, etc. Great if you want to try on sizes. Very similar to Kalamazoo show. Time: 8:00 am – 2:00 pm. Info: Pig roast with vendors on site and live music by Clearwater. All the proceeds benefit Operation Injured Solider, Allegan Alternative High School & Knights of Columbus 2515. NO ALCOHOL ON PREMISE. See the flyer HERE. Info: The oldest and probably largest blessing in Michigan. This small Northern Michigan town is all bikes for three days. The airport where the blessing occurs is a mile or so south of Baldwin. On Friday bars in the area get pretty full with live music, port-a-john drag races, events and more. Also by Friday all the vendors will be set up as well. There are a few spots for the vendors: the largest amount is on Main Street in Baldwin with a few others by the airport and the rest in the parking lot of Houseman’s Grocery Store about a half-mile north form the Airport. There is usually at least one poker run or two Saturday with one sponsored by the Am Vets. This is one of my favorite rallies (Weather Permitting!) The actually blessing is Sunday, May 19th at the airport and sponsored by the Para Dice Motorcycle Club. Gates open at 9 am and depending on the turnout the event will commence around 2-3 pm. It is not uncommon to have a wait starting on the main street and stretching a few miles. Location: Starts at VFW Post #1527 (1920 Kilgore Service Rd, Portage, MI 49002 and ends at Lamplighter Inn 5301 Comstock Ave, Kalamazoo, MI 49048. 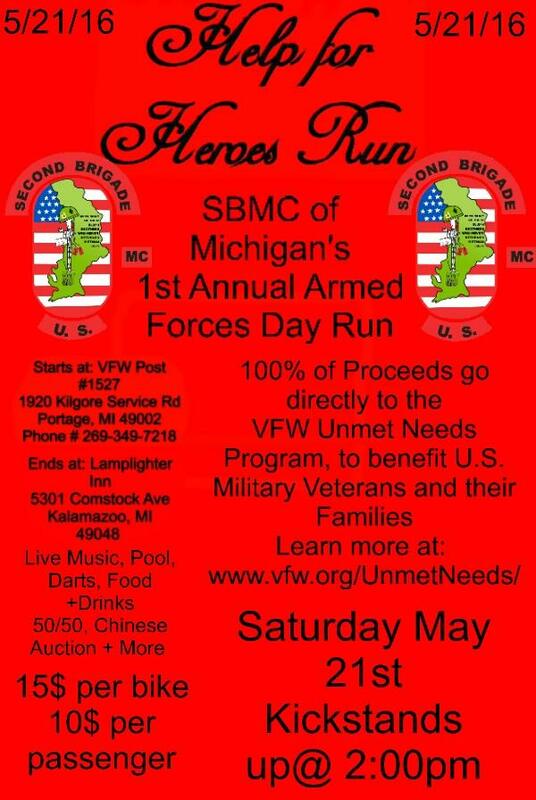 Info: Charity run with the proceeds benefiting the VFW Unmet Needs Program for U.S.Military Veterans and their families. See the flyer HERE. Info: Breakfast will be served at the post prior to the ride; it costs $8 and will be available from 8am-12pm. Kickstands will be up at 12:15 pm. Food will be included with the $10 entry fee following the ride along with live music by Bear. All proceeds will benefit local veterans. See the flyer HERE. Info: Fun event with first place for each class and overall Best of Show winner. Pre-register your bike at their website. 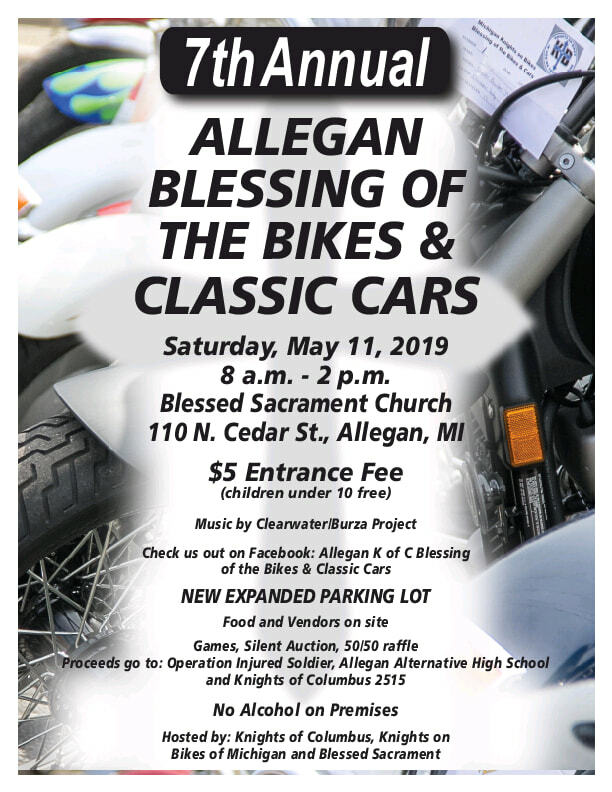 This is a family friendly event with lots of vendors, door prizes, DJ with music and the Allegan Angels. Review: The old iron bridge is, well an old iron bridge with wooden bottom sections located in downtown Allegan. If you’ve never been to Allegan before it’s a great place to ride to from almost any direction. There are a couple nice biker friendly bars in town as well, in including the Iron Bridge Bar & Grill. Time: 3-day event with music each day. Info: 3-daylong event that features Bike Burn Out, Best Bike and Bikini Contest. Live bands, including Quiet Riot and Matt Austin. Times of bands and events TBA. Time: Swap Meet Saturday 9am – 4pm. Vintage Motorcycle Ride Saturday 10am-12pm with registration beginning at 8 am. Sunday Vintage Motorcycle Show 9am – 4pm with swap meet open 9am – 4pm as well. 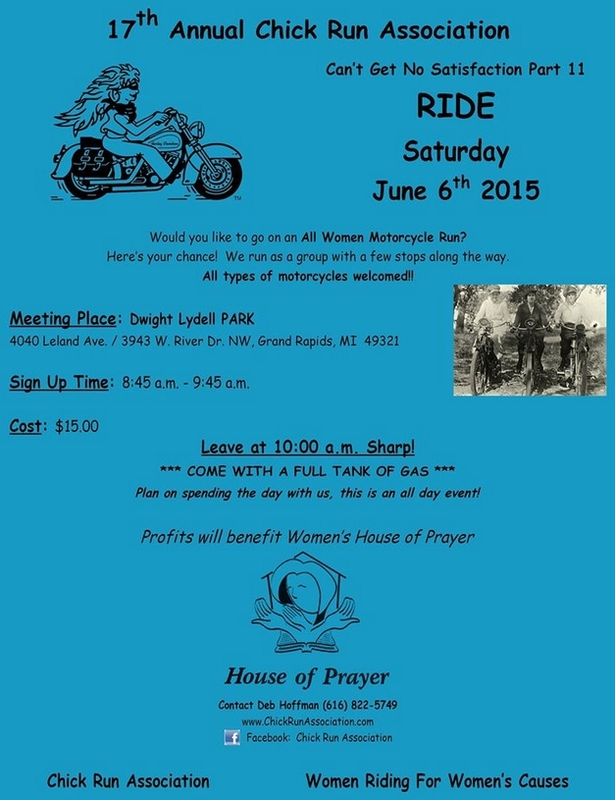 Info: Saturday escorted ride through beautiful Manistee. Saturday ride runs 12:00 pm-3:00 pm. Pig roast 3:00pm-5:00pm with beer, prizes, bike show, live music from Terri Clark and silent auction. 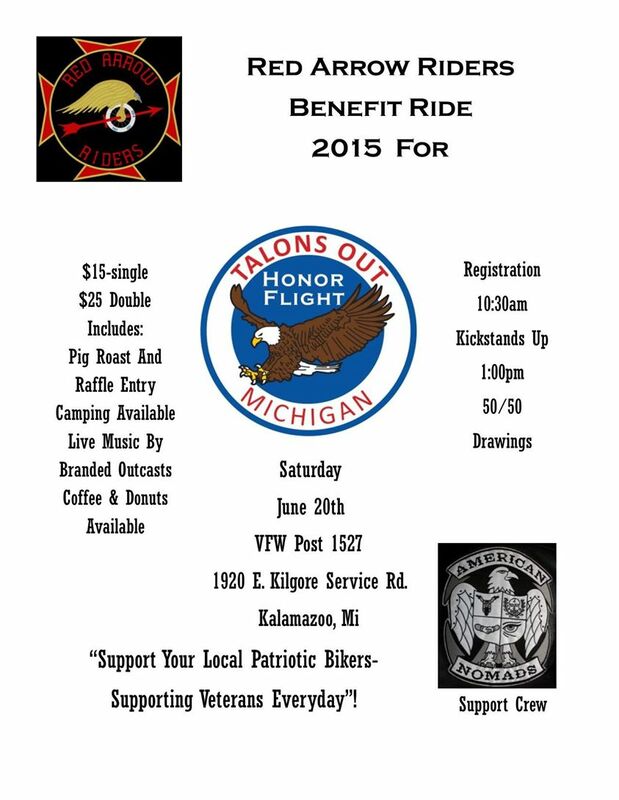 Event proceeds benefit Rolling Thunder Michigan Chapter 1. Sunday is a poker run from 12:00-2:00 pm. For registration and more info visit their website. Info: Heavily organized by Hamilton Harley-Davidson in Sturgis this week long event has different activities each day with the most going on Saturday. There are events at the Harley dealership and also in town. Check out their website for full details. Definitely worth a ride to go see. Info: Cost includes pig roast and raffle entry. Camping is available. Live music by Branded Outcasts. Coffee and donuts at start. All proceeds benefit Talons Out, an organization which sends WWII Veterans to their memorial in Washing D.C. for no cost. http://talonsouthonorflight.org/ See the flyer HERE. Info: 80-100 mile ride followed by food, drinks and live music at Texas Corral. Is part of an outdoor cook-out event that is family friendly and features activities for children. All proceeds of the event go to the Great Lakes Burn Camp. Classic car sow, silent auction and raffle also at event. BBQ begins at 2 pm. See the registration form HERE. Info: Bike contest that is part of Cadillac’s Independence Day celebration. 10 classes and trophies awarded to all class winners. Live music, vendors, beer tent, 50/50 raffles and door prizes. Cost: $20 for the weekend, $10 day pass. Primitive camping $20 per spot. Info: Loads of biker fun, biker games, jello wrestling, bands all day and night. Music and colors will be flowing off our stage. Bring your squirt guns & fill ‘em with our colors and let it rip! Be prepared for the night of your life in color! Vendors. 150′ Slip ‘n Slide. Bike Builders. Bike show Saturday morning. Lots of entertainment. Info: Three day event that features the ride in downtown Niles, MI. One of the oldest and largest burn rides around. Main street is closed off to only bikes. Vendors, bike games, dunk tank, beer garden, and two bands beginning at 6:00 pm and ending at 12:00. Sunday Morning features live music, bike games, and a 50-60 mile ride through picturesque Berrien and Cass counties in Michigan. The ride benefits the Great Lakes Burn Camp. The Camp is a special place for kids ages 6-17 to meet heal, grow and support other burn survivors. Kids share their stories and bond with other kids in a comfortable, relaxed environment. Unconditional love and acceptance is only part of what each camper receives at Great Lakes Burn Camp. Info: Event includes a bike show, contest, live music, entertainment and more. Huge event with proceeds benefiting the Wounded Warrior Project. Check out their website for all the info. Location: Downtown Muskegon, MI, Also events at Hot-Rod Harley-Davidson in Muskegon and expanding in 2015 to the old Great Lakes Downs, 4800 S. Harvey Street, Muskegon, M.
Info: One of the fastest growing biker events in the state and nation. Great time in beautiful downtown Muskegon in July. Large rally with vendors, bands and plenty of bikes. Definitely worth a ride to check out. Visit their website for full schedule and details. Info: 115 miles ride through Wexford, Manistee and Lake Counties. Silent auction, dinner, drinks, music and dancing following the ride. All the proceeds benefit Mercy Hospice of Cadillac. Time: Registration from 10 am -11:30 am with kickstands up at 12 pm sharp. After party at Teazers from 5-8 pm. Info: 50/50 raffle, chinese raffle and silent auctions. All proceeds benefit the Susan G. Komen For the Cure. See the Flyer HERE. Location: Ride starts at Land, Sea Air Travel in Paw Paw (513 E. Michigan Ave, Paw Paw, MI 4097) and ends at Paw Paw Brewery (929 E. Michigan Ave, Paw Paw, MI 49097). Info: Ride travels through the vineyards of Van Buren county and ends at Paw Paw Brewery a few blocks from where it begins. All proceeds benefit the Great Lakes Burn Camp. Part of the events surrounding Paw Paw’s Wine and Harvest Festival. If you’ve never gone to the festival, check it out it’s a great time! Info: 3 day event with the Run starting at 1 pm on Saturday. 21 & up only for rules and other information visit their website or view the flyer HERE. Location: Ride leaves the Roadhouse grill in Paw Paw and heads to Michigan International Speedway where rides can ride their bike a few laps on the track. Info: Great event, growing each year. The $35 gets you 3-4 laps on the track (Depending on turnout) and also admission to the Michigan Beer and Wine Fest which is going on at the racetrack. To register call Roadhouse at (269) 655-1122 or stop by the restaurant. Info: Ride is on for 2015; new leadership from the Sons of Malta. All proceeds will benefit the Zapata children. For more info visit the Sons of Malta website HERE or view the flyer HERE. Info: Breakfast will be served at the post prior to the ride; it costs $8 and will be available from 8am-12pm. Kickstands will be up at 12:15 pm. Food will be included with the $10 entry fee following the ride along with live music by Bear. All proceeds will benefit local veterans. Info: Ride is day before Vintage Motorcycle Show. 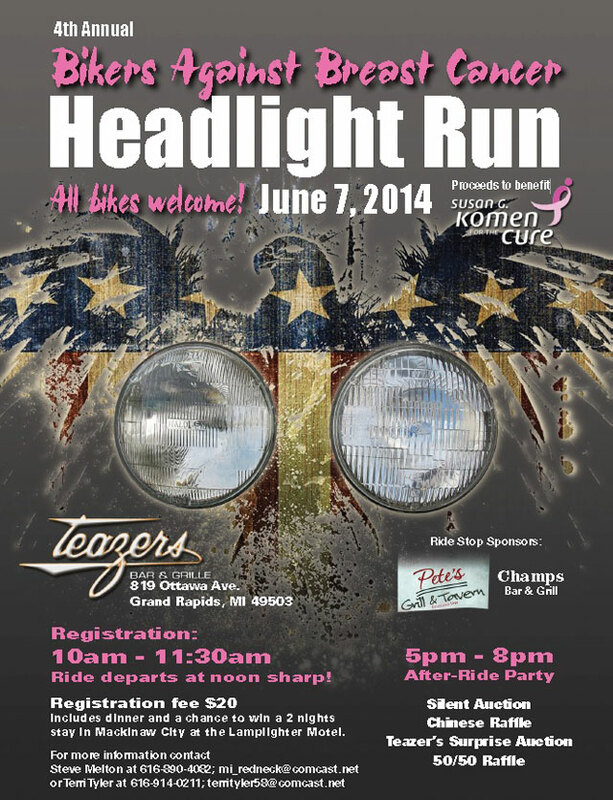 Hosted by BMW Motorcycle of Battle Creek, Ride is approximately 70 miles with a stop for lunch. Last year they had around 125 bikes participate. Info: Great event. If you’ve never been to the Gilmore Car Museum, it’s an awesome place. The pristine grounds are full of vintage motorcycles and the “track” is set up like a typical swap meet with food, parts and accessories vendors. The museum itself is open as well, so you can see the early motorcycle exhibit along with the rest. It gets VERY busy so if you really want to see the whole museum get there early. Be sure to check out the photos from previous years of the event in the gallery. Info: 43rd Annual swap meet in Kalamazoo. It’s a swap meet! DC Strong is a Non Profit Organization that brings personalized gifts and exciting experiences to children battling cancer in order to keep their spirits up and minds focused on finishing the fight. In our minds and our hearts, we know that the children are the ones that have to give their all and it is our job, at DC Strong, to remind them why they keep fighting and why it’s worth fighting for. at the Portage Best Buy 6900 s westnedge $10.00 per bike Kick Stands up at 11:00 . this will travel to the Battle Creek Best Buy.